Mosquitoes are tiny insects that pack a big punch; they make that irritating high-pitched noise against your face, cause itchy bites and carry many dangerous diseases. It's a challenge, but some wild animals, including some bird species, do their best to keep the mosquito population in check. Barn swallows live around the world, from colder regions like Alaska, Newfoundland and Canada, to southern habitats including California and northern Florida, down to Mexico, Central America and South America. Some breeds are also found in Europe, Asia, the Middle East and Africa. This swallow travels by day, eating as it flies, scooping up insects along the way. This bird is an insectivore, meaning it only eats insects, including mosquitoes in the air or on the water's surface. Eastern Kingbirds are found more commonly in eastern regions, especially in the summer. They are considered rare in the west. They nest and feed near streams, rivers and wetlands -- perfect stomping grounds for mosquitoes. Like the barn swallow, they can catch their prey in mid-air, and their diet changes throughout the year, depending on what's available. During the colder seasons, when insects are not around, they eat more berries. During the spring and summer, they feast mostly on insects, including mosquitoes. 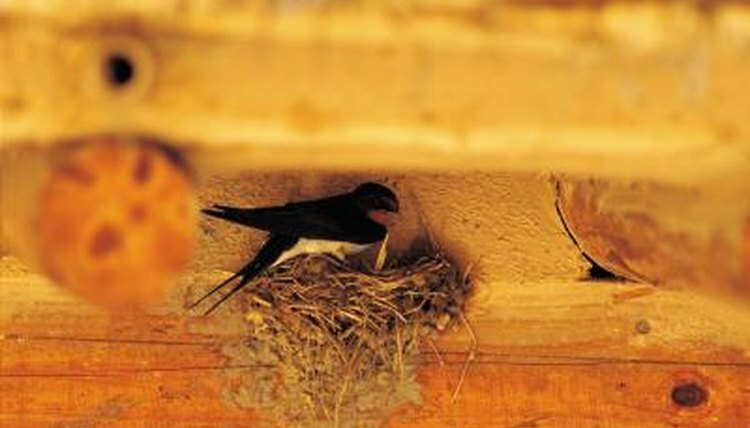 According to the Rural Survival website, swallows can eat their body weight in mosquitoes and other insects each day. Tree swallows are slightly smaller than barn swallows, with metallic greenish-blue heads, white bellies and black bills. They summer in many of the same regions as barn swallows, including Alaska, Newfoundland, Canada and California, along with Colorado, Maryland and Nebraska. When winter hits, they migrate to the Carolinas, California or the Gulf Coast. Like barn swallows, they catch mosquitoes and other insects mid-air. According to the Purple Martin Conservation Association, there are rumors that purple martins eat massive numbers of mosquitoes, but these claims are not correct. They say purple martins are indeed obligate aerial insectivores, which means flying insects are almost always the main course. However, purple martins eat a nice medley of mosquitoes, flies, beetles, dragonflies, mayflies, stinkbugs, wasps and other flying insects. Purple martins live on both East and West Coasts, and head to South America after breeding season.